SATURDAY, May 3, 2014 (HealthDay News) -- Depression may increase the risk of Crohn's disease flare-ups in people with the inflammatory bowel disorder, an early new study suggests. The study included about 3,150 Crohn's patients who completed online questionnaires about their disease, its treatment and how it affects their lives. They were also asked about how often they felt hopeless, sad, helpless or worthless. Patients with high depression scores were 50 percent more likely than those with low depression scores to have a Crohn's disease flare-up 12 months later, the researchers said. After the researchers adjusted for other risk factors, the link between depression and Crohn's flare-ups remained significant, according to the Crohn's and Colitis Foundation-sponsored study. It's scheduled to be presented Saturday at the Digestive Disease Week meeting, in Chicago. While the study found an association between having symptoms of depression and a higher risk of flare-ups among people with Crohn's disease, it did not establish a cause-and-effect relationship. 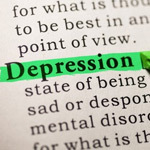 "Our study suggests that feelings of sadness and thoughts of helplessness, hopelessness and worthlessness can affect the risk of disease flares in people with Crohn's disease," lead author Lawrence Gaines, an associate professor of psychiatry and medicine at Vanderbilt University in Nashville, said in a foundation news release. "For these patients, what they think about themselves may be related to a very real medical outcome," he added. This is the first evidence that depression is linked with increased Crohn's disease activity a year later, according to Gaines. He added that doctors treating patients with Crohn's disease need to be aware that patients' feelings about themselves can have an impact on the course of their disease. "Gastroenterologists should be asking patients about depression and how their disease is affecting the way they feel about their lives, not just their disease," Gaines said.